Recent studies investigating Lithium, a drug commonly used for the treatment of mood disorders in humans, found its robust neurotrophic and neuroprotective effects which can help us exploring new novel, exciting, and promising targets. 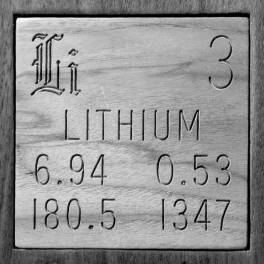 The molecular mechanism underlying lithium’s mood stabilizing effect is not yet unraveled. Suggested hypotheses include inositol-depletion via inhibition of inositol- monophosphatase and neuroprotection, via inhibition of GSK-3. Chronic lithium treatment increases dentate-gyrus neurogenesis in adult rodents , reduces mice immobility in the forced-swim test (FST) model of depression  and attenuates amphetamine-induced hyperlocomotion model of mania . Bessa et al  showed that antidepressants retain antidepressant-like effect in the FST even when neurogenesis is blocked. It has been hypothesized that blockade of neurogenesis will not affect lithium’s behavioral impact. Specifically, we studied whether lithium-induced decreased immobility in the FST and attenuated amphetamine-induced hyperactivity remain under neurogenesis-arrest conditions. The results suggest that lithium’s effect on neurogenesis is not involved in its antidepressant-like mechanism. Given ample evidence suggesting that lithium promotes neurogenesis via GSK-3β inhibition  it is plausible that lithium’s antidepressant-like effect is not mediated via GSK-3β inhibition. Studies reported that, there is an increased neurogenesis in homozygote knockout mice of the inositol transporter. Since these mice exhibit lithium-like reduced brain inositol and behavioral phenotype  which suggest that inositol depletion rather than GSK-3 inhibition mediate lithium’s mood stabilizing effects. How this will benefit People with Dementia? One of the hallmarks of Alzheimer’s disease is the build-up of plaques of amyloid-beta, along with the neurofibrillary tangles, cause neurons to die, which leads to the symptoms seen in Alzheimer’s disease. Understanding how lithium interacts with amyloid-beta to prevent it from being toxic to neurons would help researchers to better understand that causes of Alzheimer’s disease, and would pave the way for new treatments. Due to the accumulating data linking lithium mechanisms of action with the enhancement of neurotrophic cascades and pathways, I am optimistic that these evidence will eventually lead to a better understanding of clinically relevant pathophysiological targets, however these hypothesis are yet to be tested in human subjects.